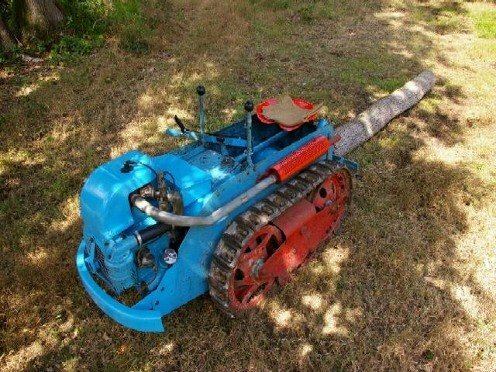 The plan is to use a choke chain on the drawbar to secure logs to the crawler, and in tests along the ride a 10 foot oak log about 9 inches in diameter presents no problem. It remains to be seen what the MG5 can do to lighten the load during real extraction work, but to be honest any work that it can do that reduces manual labour will be very welcome. The engine is a 6hp, 600cc air cooled sidevalve. Carb and fuel pump are Amal parts, the magneto is a Wico A series. A centrifugal clutch drives reduction gears and differential in large central box, there are only two gears, forwards and reverse. Two brake bands provide steering, then reduction gears each side drive front sprockets on the tracks, which are rubber jointed. Parts supply is surprisingly good. 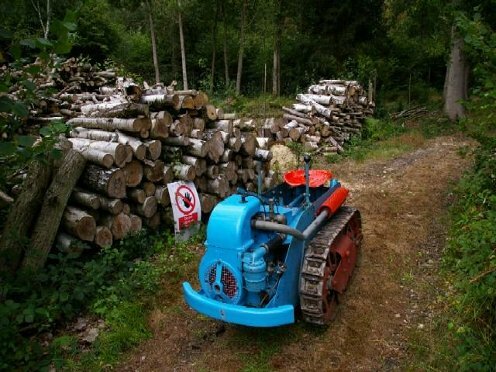 April 2010: I've now had a session extracting about two dozen 10 foot lengths of birch and beech, and the MG did brilliantly, the extraction is simplicity itself, and lightens the load considerably. Loading and unloading the MG from a trailer is another matter - fiddly and heavy work! 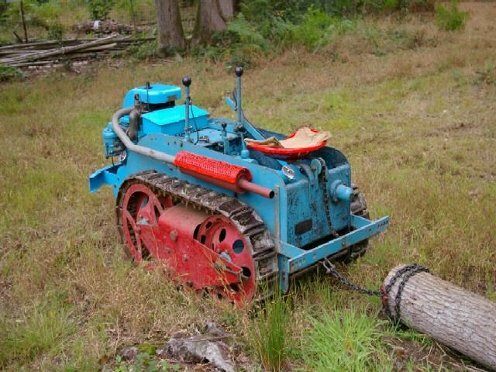 Definately best to wait until there is a good load of work to do before taking the Ransomes to the wood. August 2011: I've now sold the crawler. As I'm not felling standards now, and mainly coppicing, I couldn't justify keeping it. However, I think it proved itself capable of the work, and well suited to the site. If there was someting like it but younger and easier to maintain it would be ideal.